Practical answers for the concerned buyer of a Torah Scroll. A group of Sofrim ( Sta"m scribes) proposes informed responses. 1. How much does a Torah cost? What is the difference in price for an Ashkenazi Torah as opposed to a Sephardic Torah? Each Torah is priced differently. Following you will find some explanations for this. A Torah scroll is not mass produced. Its manufacture requires many skills and talents. There are sofrim who take a whole year to write a Sefer Torah and others who manage to complete the job in 8- 9 months. In any case, it entails an investment of close to one full year’s work. It is therefore impossible to find a properly written Torah for less than NIS 85,000. The price of the parchment alone amounts to NIS 15,000. 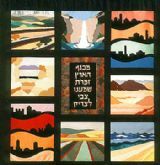 If we take into account the months of writing, proofreading and sewing and add the v.a.t., we consider that a superior Torah scroll will cost close to 150 thousand NIS. If the price quoted is much lower than this, it could indicate “shortcuts” or an accounting error. The disparity between prices is the result of writing quality and the sofer’s (scribe’s) experience and skill. An Ashkenazi Torah takes longer to write and is therefore more expensive in comparison with a Sephardic Torah of the same quality. 2. How will I identify the quality proffered? How will I recognize which letters are Ashkenazi, Hassidic, or Sephardic? How do I know the parchment has not been treated (with lime)? The differences are known to all sofrim and it is possible to acquire a page with sample of letters in an assortment of styles. Please see picture at right. One must take a example of the writing to a neutral observer, who is familiar with the differences. It is possible to obtain an opinion from an institute specializing in STAM proofreading, or to ask an experienced sofer. As for the lime treated parchment, this practice no longer exists. Today, it is possible to obtain a photocopy of a Torah excerpt by email in order to examine the writing quality. 3. Is a Torah Scroll whose last letters are extended considered more attractive? Not at all. A professional sofer plans his writing so that the letters are more or less uniform. The phenomenon you mention is the result of poor planning or lack of confidence. An inexperienced sofer STAM minimizes his writing at the beginning of the line and is then forced to stretch the letters in order to fit into the line. In other words, stretching the letters is constrained or even the result of negligence. There are places where the elongated letter is structural, in the poem “Haazinu” (“Listen heaven…”, Deuteronomy) for instance. 4. Does the Sephardic Torah scroll require a case or can it be mounted on rollers? Many Sephardic congregations throughout the world continue to read from a Sephardic Torah mounted on rollers and there is no prohibition of this practice. In Israel it is widely accepted to enclose the Sephardic Torah Scroll in a specially designed case. 5. What is the difference between a Sefer Torah written on a 21.5” parchment and one written on a shorter parchment? A “tall” Torah scroll enables, or “requires” relatively larger script, as opposed to a “short” Torah written in smaller letters. There are those who prefer the former and others who prefer the latter. There is a certain disparity in the price of the parchment but it is almost unnoticeable when taking into account the overall expense. On the other hand, the larger writing allows a faster writing pace. The thicker letters endure longer. Then again, the larger writing contributes to the weight of the Sefer Torah which in turn contributes to the bulkiness of the Torah case. This could be problematic in a community where there is a large elderly population. 6. What are the differences between parchments? Why do some of the sheets of the Torah scroll have dark stains on the reverse side? The specially prepared parchment for writing the Sefer Torah cannot be mass produced. The sheets are produced from the hide of the back of a calf. The writing is on the inside of the sheet of parchment. Some of the parchments are refined to the level of “velvet” and others are rough. This effects the speed in which the writing is accomplished and the quality of the letters. There are thin sheets and others are extremely thick and yet others are medium thickness. Sometimes one can find all these attributes in a single sheet. A skilled scribe will spend time choosing the parchment he prefers. There are sofrei STAM who would rather have velvety parchments and others who actually prefer rough or plain smooth. The stains on the reverse side are pigmentations remaining from the back hairs of the calf. If calfskin has brown or black spots it will show up on the skin base. Usually, the spotted or grey sheets are superior quality. A sofer STAM who uses transparencies and a light box fo his work area will prefer a solid white sheet which will allow him to see the letters from the transparency through the parchment. 7. Which is preferable? A restored Sefer Torah or a new Torah scroll? A ready made Torah or one specially ordered? An old refurbished Torah scroll is still on aged parchment, possibly lime- treated, and all corrections are apparent and will remain so. It would make more sense, in the absence of an appropriate budget for a new Torah scroll, for the money to be more wisely invested in “rimonim” (Torah ornaments) or a Torah case, Torah crown, or megillahs, etc. 8. Which is preferable, buying a Torah from a proper agent or directly from the sofer STAM? Will it cost less when purchased from the sofer? The purchase of a Sefer Torah from a proper agent should be the most acceptable, frugal and optimal method for you. Purchasing a Torah is a complicated undertaking under any circumstances, both financially and emotionally. Usually one commissions a Sefer Torah once in a lifetime and he therefore has little understanding of what is involved. In this case, he will run around in circles and waste a lot of time and accomplish very little. On the other hand, a reliable agent (How will you know that he is reliable? Ask around and listen to those who have already been in contact with him. Check his references, read letters of recommendation. Verify that he too is a certified sofer STAM, familiar with the profession, etc.) can advise you and help you obtain a Sefer Torah in accordance with your needs, time constrictions, budget restrictions, and style. Purchasing through an agent does not prevent you from knowing who the sofer is. You will usually be given his name and will be able to meet him. A sofer STAM who is not willing to reveal his identity is most probably not registered with the IRS. It is correct to assume that the price you pay an agent will be no higher than what you would pay directly to a sofer. Many sofrei STAM prefer to immerse themselves in writing and to leave the sales to a paid professional. Many also provide work beforehand for their agent and may even receive advance premiums from him. You will succeed in achieving your objective and receive full value for your money. There are also transitional situations: After you have received satisfactory information, the agent will contact you directly for your order with the sofer STAM of choice. 9. Should one sign a contract for the purchase of a Sefer Torah? Is it possible to obtain the correct form? As with any significant exchange it is advisable for a written contract to be drawn up in advance. You can find such a contract/ form through this website. Please refer to other items here in “Tips for the Purchase of a Sefer Torah”. 10. Where can one engrave an inscription on the silver disk to be attached to the “Atzei Chaim” (Torah rollers)? What is the approximate cost? There are several competent artists. Contact us and we will provide an address. The price is a function of the number of disks ordered and how many letters are engraved. In any case the average cost of disks for a Sefer Torah is about NIS 1300. We will be happy to provide guidance and service in all aspects of the Sefer Torah and related products. To arrange an appointment and/ or view a sample by email. We attend to all essentials. We are a group of sofrei STAM who produce and market Torah scrolls and related products as well as providing assistance and acting on behalf of various sofrim. We offer the benefit of our expertise, using our knowledge and skill to provide you with exactly what you need. We are a factory outlet. Related products, such as Torah rollers or a Sephardic Sefer Torah and mantles for the Torah Scroll, etc. can be purchased here as well. 11. Is one required to have a ceremony commemorating the installation of a Sefer Torah? Does one have to provide a seudah (meal)? Is music, torches, etc. necessary? Writing a Sefer Torah and installing it in its ark is an important mitzvah (Torah law) and comprises the joy of performing the mitzvah. 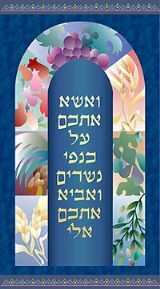 There are several versions of the text to be read upon the installation of a Sefer Torah. In any case, there is no obligation to organize a procession or to hire a band. A modest ceremony can be coordinated with the shul (Beit Knesset/ synagogue) committee.